This summer, take the kids out to visit some of the San Francisco Bay Area's local wildlife! The best way to do this is to pay a visit to one of our local wildlife centers or preserves. Some of these centers serve both as rescue resources for sick and injured wildlife and education resources for the community, too, while other seek to preserve the natural habitats of our wild neighbors. Visiting a wildlife center is a fun alternative to visiting a zoo, and a great opportunity to learn about the animals and birds who live in the amazing place we all call home. Here's our guide to wildlife centers and preserves in Marin County and the San Francisco Bay Area. Many of these centers offer programs like animal feedings and guided tours; check their websites for hours and admission fees, if any. WildCare is an amazing urban wildlife rehabilitation center that helps out thousands of ill, injured, or orphaned wild animals from around the Bay Area. They also undertake wildlife and nature education and operate a 24-hour Living with Wildlife Hotline. The WildCare courtyard and museum are open to the public daily from 9 am to 5 pm. Daily feedings and other programs take place at various times between 11 am and 4:30 pm. The courtyard is always open, but the museum access may be limited when summer camp is in session. Admission is free. WildCare is located at 76 Albert Park Lane in downtown San Rafael. For more information, directions, and a complete schedule of events, visit them online at www.wildcarebayarea.org. If you have an injured or orphaned animal to report, call them at (415) 456-SAVE (7283) 24 hours a day, seven days a week. Read about our visit to WildCare. Marin's Marine Mammal Center has been rescuing and caring for sick, injured, malnourished, and abandoned marine mammals—including elephant seals, seal lions, harbor seals, sea otters, and even whales—since 1975. Located at Fort Cronkhite in the Marin Headlands, the Marin Mammal Center's new $32 million facility opened in the summer of 2009, and offers daily tours, as well as educational activities for the entire family, especially on Marine Science Sundays, which take place on the second and fourth Sundays of each month. Admission and self-guided tours are free, and you can pick up a guide card from the information desk (remember to return it on your way out). Volunteer docents are usually on hand to answer questions about what's going on and who the current patients are. The Marine Mammal Center is open every day (except Thanksgiving, Christmas, and New Year's Day) from 10 am to 5 pm. It's located at 2000 Bunker Road at Fort Cronkhite in the Marin Headlands near Sausalito. For more info, visit www.marinmammalcenter.org or call (415) 289-7325. Read about our visit the Marine Mammal Center. Run by Audubon Canyon Ranch, Martin Griffin Preserve is a 1,000-acre preserve off Shoreline Highway near Stinson Beach and Bolinas that's home to one of the West Coast's most important nesting sites for Great Egrets. These large and majestic wading birds nest in the redwood trees that surround the preserve, and can be observed every year in spring and summer. In addition to viewing and learning about egrets, you can take a hike on one of the preserve's trails, look for California newts in the pond, and search for wildlife in Bolinas Lagoon at the Clem Miller Lookout. Volunteer docents are on hand to answer questions and help out. From April through July, the Martin Griffin Preserve is open Saturdays, Sundays, Memorial Day, and the 4th of July from 10 am to 4 pm. It's open weekdays by appointment only, and closed Mondays. Actual opening days vary from year to year, so check their website for an up-to-date schedule. A $15 suggested donation is requested for admission. 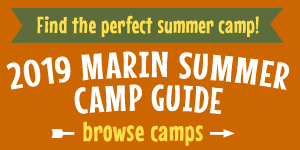 The Martin Griffin Preserve is located at 4900 Highway One, Stinson Beach 94970. Learn more at auduboncanyonranch.org or call (415) 868-9244 ext. 110. The public is welcome to visit Tiburon's Richardson Bay Audubon Center and Sanctuary to bird watch, take a hike, have a picnic, explore the beach, and tour the historic Lyford House (on select days only). The center also offers guided bird walks, youth programs, and summer camps. The Richardson Bay Audubon Center and Sanctuary is open Monday through Friday from 9 am to 5 pm. It's located at 376 Greenwood Beach Road, Tiburon 94920. For more info, visit richardsonbay.audubon.org. Sonoma County Wildlife Rescue's Petaluma facility has been open for public tours since 2007. Guided tours are offered on Saturdays only at noon and 2 pm from May through September and 2 pm from October through April. Tours cost $15 for adults, $10 for kids 4–12, and are free for children under 4. On a tour you'll learn about native wildlife species and their habitats, and meet non-releasable education ambassadors including a red-tailed hawk, foxes, coyotes, racoons, a bobcat, opossums, and more. Tours can fill up quickly, so reservations are recommended. Call (707) 992-0274 to reserve your spot. Private tours, for groups of 25 and more, are available, too. Sonoma County Wildlife Rescue is located at 403 Mecham Road, Petaluma 94952. Learn more about them at www.scwildliferescue.org. This student-run wildlife museum at Petaluma High School has diorama exhibits and over 50 species of live animals, from insects to mammals. It's open to the public on the first and third Saturdays of the month from 11 am to 3 pm. Admission is $5 for all visitors over age 6. The Petaluma Wildlife and Natural Science Museum is located at 201 Fair Street, Petaluma 94952. Learn more at www.petalumawildlifemuseum.org. Spring Lake's Environmental Discovery Center is natural history museum with hands-on exhibits, a tide pool with live touchable sea creatures, Shelby the turtle, wildlife displays, and more. Naturalists lead family programs including hikes (September through May) and Science Saturdays. Admission is free. There is a $7 parking fee at the park (free for Sonoma County Regional Parks members). Spring Lake Regional Park is located at 393 Violetti Road in Santa Rosa 95409. The Discovery Center is open Wednesday through Sunday from noon to 5 pm. For more info visit parks.sonomacounty.ca.gov or call (707) 539-2865. Tilden Park's Nature Area is a 740-acre preserve that's home to a large number of animals and plants. The Environmental Education Center offers dioramas and animal exhibits as well as naturalist programs, and the Nature Area is home to plenty of family-friendly hiking trails. Make sure you visit the adjacent Little Farm to meets some not-so-wild animals while you're there, too. The Tilden Park Nature Area is open daily from 5 am to 10 pm; the Environmental Education Center is open Tuesday through Sunday from 10 am to 4:30 pm. Admission is free. The Nature Area is located at the north end of Central Park Drive (near Canon Drive), Berkeley, 94708. For more info, visit www.ebparks.org/parks/tilden/tna or call (510) 544-2233. Read about our visit to Tilden Park. San Francisco's Randall Museum is home to over 100 animals that can't be released back into the wild. On Saturdays at 11 am, a selection of these special animal ambassadors come out to visit with museumgoers. Meet rodents, amphibians, a Swainson's hawk, and even a touch a tortoise. Admission to the Randall Museum is free, although donations are greatly appreciated. Currently, the Randall Museum is undergoing construction at its regular location in Corona Heights Park. You can visit the museum's animal ambassadors at the Mission Art Center, located at 745 Treat Avenue, San Francisco, 94110. It's open Tuesday through Saturday from 10 am to 5 pm, closed Sunday and Monday and major holidays. Learn more about the Randall Museum at www.randallmuseum.org. The Amazing California Trail at the Oakland Zoo is Now Open!